With iOS 11.2.5 final version out, here are release notes, changes and security content details you need to know about. 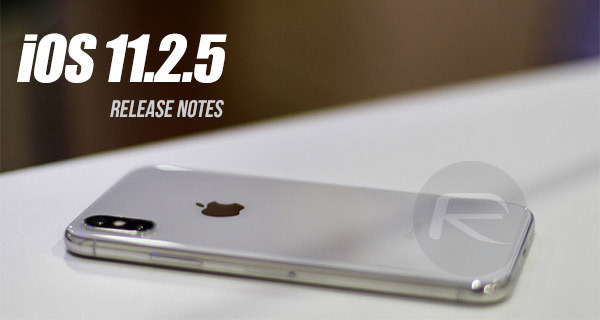 If you are an active iPhone or iPad user, then you will likely already be aware that Apple has officially released iOS 11.2.5 to the general public after having the firmware in a pre-release state for multiple betas. After going through that prolonged period of testing, Apple has now deemed iOS 11.2.5 ready for the prime time, which means that it is currently making its way onto a plethora of compatible devices around the world. But what exactly can those device owners expect to receive and gain from the installation of iOS 11.2.5? That’s where Apple’s release notes come in extremely handy. Each individual pre-release seed can be inspected manually to try and ascertain what’s actually new but that becomes increasingly difficult to manage and keep track of. We already know that iOS 11.2.5 is a relatively minor bug fix release, with earlier version numbers being kept for any emergency fixes or patches, such as those found in iOS 11.2.2. However, iOS 11.2.5 is an interesting proposition as it’s not all about under-the-hood improvements and minor patches. You may remember that we brought you the news about a particularly annoying bug in iOS and macOS which affected the native Messages app by causing it to crash when a malicious text was received. Known as chaiOS, the bug has been affecting devices around the world as more people find out about it and more individuals start sending the malicious URL around as part of a comedic routine to prank their friends and family. With iOS 11.2.5, Apple has officially fixed that bug on iPhone and iPad hardware, meaning that it can now successfully render the malicious URLs without issue. Apple though for some reason hasn’t mentioned it in the release notes even though the company confirmed last week that iOS 11.2.5 contains a fix for it. The nuts and bolts of this release are that Apple has done a wonderful job of improving stability, offering under-the-hood improvements, and even fixing a fairly important and extremely niggling bug in the form of a patch for chaiOS, in addition to adding support for HomePod and full featured Siri News (initially added in 11.2.2). Check out the official release notes below for more information directly from the horse’s mouth. iOS 11.2.5 includes support for HomePod and introduces the ability for Siri to read the news (US, UK and Australia only). The update also includes bug fixes and improvements. – Setup and automatically transfer your Apple ID, Apple Music, Siri and Wi-Fi settings to HomePod. – Siri can now read the news, just ask, “Hey Siri, play the news”. You can also ask for specific news categories including Sports, Business or Music.